Even if you’ve never had orthodontic treatment, you are probably familiar with what braces look like and what they are used for: moving teeth. You may not be aware, however, that orthodontists (“ortho” – straighten, “odont” – tooth) have a variety of appliances they can use to help move teeth, especially when extra anchorage is needed. Let’s start by explaining how orthodontics works, so that you will be able to understand what anchorage is and why it’s necessary. The reason that teeth can be moved at all is due to the particular way in which they are attached to the bone that supports them. While you may think of teeth as immovable pillars, they are actually not completely stationary. A hammock-like network of microscopic fibers known as the periodontal ligament (“peri” – around; “odont” – tooth) connects the teeth to the bony sockets in the jaws. The fibers of the ligament attach into the tooth surface on one side and into the bone on the other. Since the periodontal ligament is elastic, there is micro-movement of the teeth all the time with even the gentlest forces from biting. 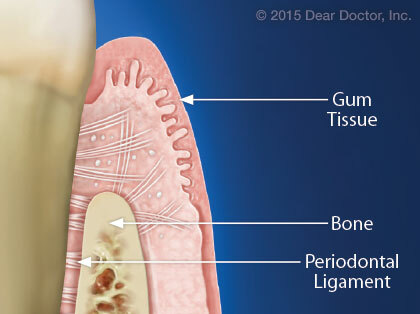 More importantly, the tissues of the periodontal ligament are living and thus are constantly changing and remodeling. Think about what happens when you push a stick through sand: The sand builds up in front of the stick in the direction of the movement, and fills in the void behind it. Similarly, when a light and controlled force is placed on a tooth, a pressure side forms along with a tension side. The tension side responds to the force by growing new bone and the opposite (pressure) side results in bone being resorbed (removed). The tooth thus responds by slowly moving into a new position. The forces applied to the teeth to move them must be small, light and continuous so as not to cause damage, and constant enough to allow adequate time for these tissues to remodel and secure the teeth in their new position. 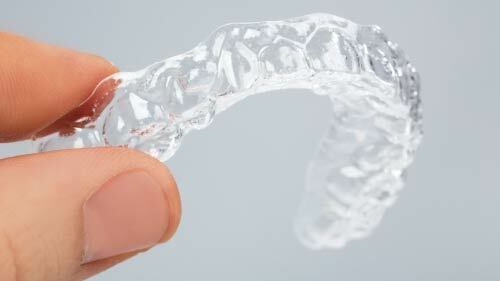 Braces or clear aligners are commonly used to deliver orthodontic forces to the teeth. But remember Newton’s third law of motion? “Every action has an equal and opposite reaction.” Now we’re getting to what anchorage is all about. Moving teeth is a bit like a tug of war, where you’re pitting forces against each other. If you want to win the tug of war, you need more weight on one side than the other; in other words you need good anchors, or more anchorage. The simultaneous use of multiple types of anchorage, from ligatures tying multiple teeth together and chain elastics to TADs (temporary anchorage devices), allows for control of orthodontic forces to move teeth with precision. When your orthodontist is moving one or a group of teeth, he/she is applying forces to them to make sure that only they move, while the anchor teeth against which they’re pitted do not move. This is where the orthodontic term “braces” comes from — bracing one tooth or group of teeth against others. Teeth with larger roots have a greater resistance to movement, which is why back teeth (or groups of teeth) often serve as anchorage units in orthodontics. 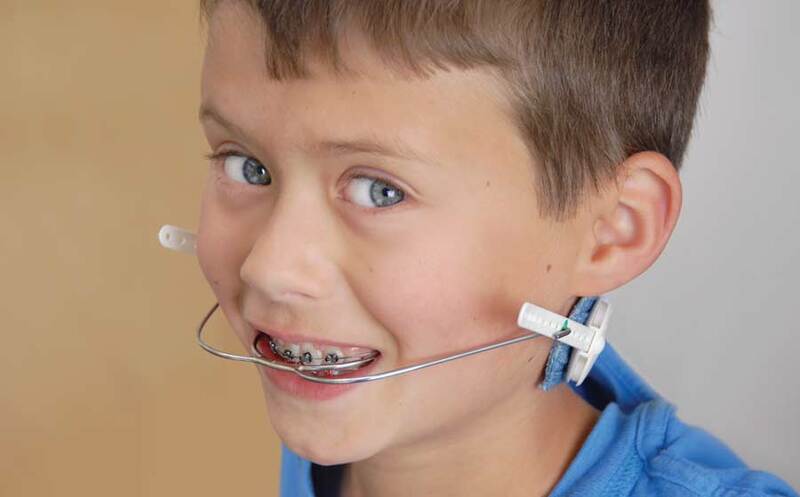 When the teeth cannot supply enough anchorage by themselves, the orthodontist must use additional means. Anchorage can also come from the orthodontic patient’s own skull or dental implants that are placed in the jaw temporarily. Both of these methods have the advantage of being completely immovable. Headgear can be used not only to affect the position of teeth but also to influence the growth of facial structures — for example, to correct jaw position if either the upper or lower jaw is too far forward or too far back. Therefore it is used only in preteens who are still growing. Headgear consists of a strap that runs around the back of the head or neck and attaches to orthodontic brackets, usually on molar teeth. In the case of “reverse pull” headgear, the strap comes over the chin and/or forehead. Headgear is usually worn 12 hours per day. The objective here is to move the front teeth towards the back teeth to close the space without allowing the back teeth to move forward. The use of TADs (temporary anchorage devices) eliminates that risk. Temporary anchorage devices (TADS) are mini screws that are temporarily placed into the jawbone to be used as non-mobile anchor units. They are quite small and can easily be placed with minimal, if any, discomfort using local anesthesia (numbing shots in the area), or sometimes the newer, more concentrated topical agents (which don’t require shots). TADS, made of stainless steel, do not fuse to the bone that surrounds them so they are simple to remove. They do, however, have very close bone-to-screw contact, which ensures their stability. Micro-implants, made of titanium just like regular dental implant tooth replacements, do fuse to the bone thereby providing increased stability for anchorage. But because they are so small, they are also easy to remove once their job is done. Clear aligners in part by joining groups of teeth together to prevent movement, while allowing forces to be placed only on the teeth that need to be moved. Instead of using metal or plastic brackets and wires to move teeth as with traditional braces, clear aligners are actually custom-made clear trays that are computer-generated. The principles of the way the teeth are moved, however, are the same. Anchorage is provided by the trays, which closely fit against some of the teeth, in effect joining them together and preventing them from moving. The teeth to be moved have a different relationship to the trays; here the trays are constructed to apply light and continuous forces to move them in precise directions a little at a time. The trays need to be changed every two weeks until the new bite and smile are just right, and the teeth are stable in their new, improved positions. 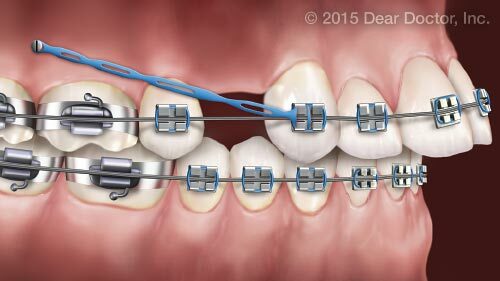 Finally, elastics (rubber bands) that hook onto braces can be used to move individual or groups of teeth in a jaw (also known as a dental “arch”), or to provide what’s known as “cross-arch” anchorage from one jaw to the other. 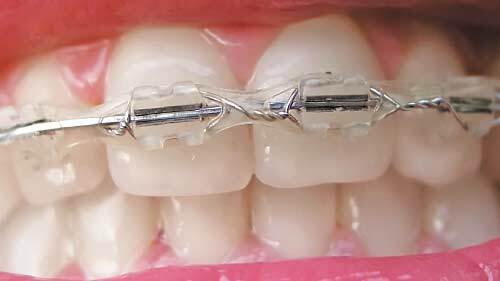 Elastics can either be used to reinforce anchorage, by preventing teeth from moving, or alternately to move teeth, depending on how and where they are placed. If placed so that they stretch between arches, they may reinforce anchorage in one arch, while moving teeth in the other. Combinations of all these potential anchorage devices can be used to allow for the slow progression of tooth movement. As the teeth line up, they can be attached to other anchorage units and so on to correct tooth position in stages. 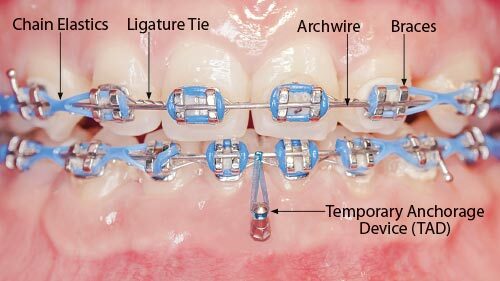 Anchorage reinforcement may not always look pretty, but it’s a vital part of orthodontics. After all, it is the use of anchorage that allows a dentist to move teeth into their proper positions for a beautiful smile.